Designed by a student of le Corbusier, this villa combines Provencal charm (stuccoed walls and tile roofs) with an open modern plan, all arranged on a few levels (the main floor is on three levels, so the elderly and the very young will want supervision) with a full pool and spectacular view of the Mediterranean You can see a panorama extending from The hills of Monte Carlo to Corsica (on a clear day) to Cannes, all while lounging by the pool beside fruit trees, and sipping on the local Vin du Var. We are in a nature district, so great hikes up mountain streams or along the foothills of the Maritime Alpes are nearby. Vence, a charming hill town is 5 minutes away, with cafes, restaurants and shopping, and St. Paul de Vence, with its famous galleries, museum and boule court, is 10 minutes. Haute cuisine restaurants, including the well-resepcted Chateau St. Martin, from modest to extravagant, are peppered throughout the neighborhood, and both Nice and Cannes, with their famous promenades, hotels, museums, beaches and shopping are 20-30 minute drives. This is our family home, which my parents purchased after traveling to the Cote d'Azur for thirty years and searching for the perfect perch above the sea. It possesses charms for young and old, loungers and sightseers, athletes and intellectuals, connoisseurs and folks who just want to chill. It is not luxurious, but it is comfortable, serene and tasteful. It is the most relaxing place I know. I am a teacher in Bronx, NY and a lover of the Cote d'Azur. The contact info will lead you to our property manager. My parents summered in Vence and the Cote d'Azur and I fell in love with the area. Shopping in the old city of Vence. The local museums. The best restaurants in the world. An unparalleled view and a simple life by the pool. Beautiful river and mountain hikes right outside the door. Three bedrooms and the living room are air-conditioned. This is a comfortable country kitchen. 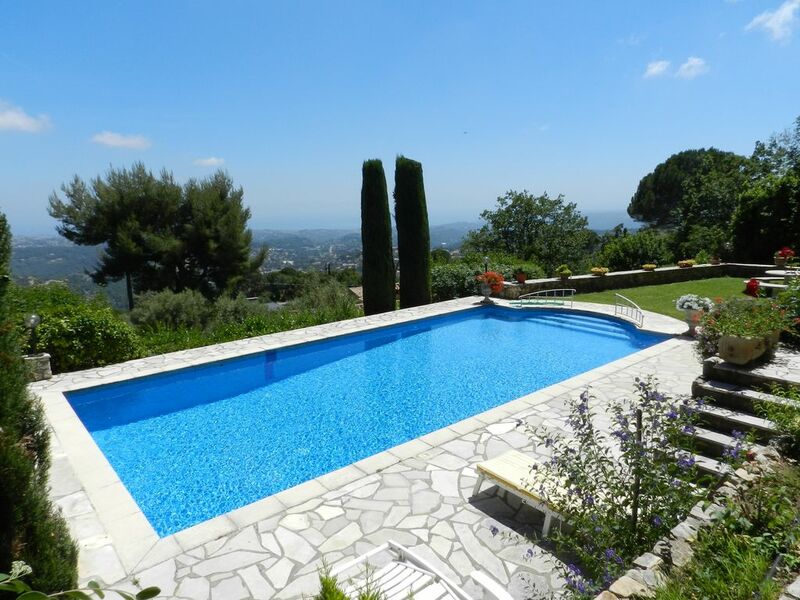 Fruit Trees, Onsite Cook Available, Hiking Nearby, Close to Matisse Chapel and Museums and Galleries in St. Paul De Vence. We have stayed at Le Piol on several occasions in the past 5 years, most recently in June this year. It is accurately described by the owners as a place of great serenity and we have always (even, now, with a young family) found it to be relaxing and invigorating. The outside space is simply spectacular and the villa is cleverly designed to encourage outdoor living. The views are breathtaking; the entirety of the Riviera is on display and the play of light and colour throughout the day, but particularly around sunset, is quite magical. The immediate region is charming; Vence is an appealing place to spend time (a stroll around the old town followed by a coffee and an ice-cream is time well spent) and St Paul de Vence is laughably pretty. Le Piol is well-placed for day trips, including to the coast, which is accessible by car, but we have tended to spend most of our time enjoying the simple pleasures the villa offers. We could not recommend it more highly and look forward to our next visit. The phrase "exceeded expectations "may be overused in advertising, and we had been to the VRBO website, but there is no other way to describe our reaction and that of our guests as we took in the view from the porch for the first time. And we felt that way with each sunrise and sunset! We were all intrigued by the design and furnishings in the living rooms, and how eight adults could gather together or find individual space. We did our best at sampling the local cuisine, both at the villa and away. The garden setting (and people watching) at Le Colombe d'Or was wonderful; the food, we felt, did not match that level. Your recommendation of Chateau St. Martin was fulfilled, and the food matched the setting on the terrace. I've been meaning to send you a note - we are back from our trip and had the most amazing time in your beautiful villa, it is paradise. We enjoyed so much in 3 short days - day trips to Nice, Cannes, and even a drive to Monte Carlo - the boys loved looking at all the fancy cars outside the casino. We went to the Matisse and Chagall museums in Nice, and the Matisse chapel in Vence. We also found our way to the river and enjoyed a fabulous hike and swim in the waterfalls - the kids were in heaven! Finally, my favorite - St. Paul de Vence - a journey back in time. Incredible! Thank you so much for everything - the villa is a really special place and we hope to return someday. We rented this villa July 14th, 2012 for 1 week. We have vacationed several times in the south of France and have always rented villas and this was by far, our favorite villa to date. We were two families, 4 adults and 4 kids (ages 4-7). The accommodations were comfortable, the main living areas were decorated beautifully, and we loved the layout of all the different levels. We spent most of our time outside on the terraces and at the pool and the view from anywhere in the back is breathtaking. We could see all the way from Italy to the east and Cap d'Antibes to the west. The only thing that was different from advertised was the TV/DVD/stereo system. There was no DVD player and no stereo system to play music by the pool other than a portable radio/CD player, so make sure you bring CDs if you like to listen to music by the pool. The description of the villa has since been modified on its website and no longer includes this, but we did not know this beforehand. The villa is located pretty high up and the road is narrow and steep leading up to the villa, but well-worth the drive up. The town of Vence is charming to say the least and we were within easy drives to all the surrounding towns. I absolutely loved our stay and am already making plans to return next summer! Thank you for a wonderful vacation! Thank you, Maribel. It was a pleasure having you at the villa. Our villa manager told us you were very enjoyable guests. Thank you for your kind review. This is no ordinary villa, but an oasis of calm and beauty in this already wonderful part of France. Most rooms have spectacular views over the foothills, Cap d’Antibes and the Mediterranean. On a clear day you can see the peaks of Corsica rising like a mirage out of the sea. The house itself is spacious, well-designed and has artistic touches echoing the Matisse Chapel just down the road in Vence. The spacious garden and pool area with its own small kitchen is its own delight and is completely private from the other houses on the hill. The location is superb, just a few minutes from restaurants and shopping in Vence and a few more from the artist’s village of St. Paul de Vence and the remarkable art museum at Fondation Maeght nearby. The Airport and Nice is just 1/2 hour away and Monaco, Antibes, nearby mountain villages like Grasse, Biot and the rest of the Cote d’Azur is all within easy reach for day trips. We had an unforgettable stay in August 2011, and can’t wait to go back. We stayed in this villa several years ago and I was delighted to Google it at VRBO to recall our lovely days there. I think if one likes quiet, peace, spectacular views out to the Nice airport and the Mediterranean, this is a perfect spot. I especially remember the breakfast patio, lovely hours by an almost infinity-like view pool, a grassy area for children to play, charming contemporary architecture, and access to interesting hikes, museums, day trips and restaurants - one with high and sweeping views of the Mediterranean. I do hope we will be able to visit this villa again. I actually came home and did a pastel drawing from our photos of the marvelous angels/lines of the home. Close to some of the Best Restaurants, Beaches, Museums, Water Sports and Galleries in the World. We are in a nature district, so great hikes up mountain streams or along the foothills of the Maritime Alps are nearby. Vence, a charming hill town is 5 minutes away, with cafés, restaurants and shopping. St. Paul de Vence, with its famous galleries, museum and boule court, is 10 minutes away. Haute cuisine restaurants, including the Chateau St. Martin, are peppered throughout the neighborhood, and both Nice and Cannes, with their famous promenades, hotels, museums, beaches and shopping are 20-30 minute drives. Enjoy both St. Paul de Vence and the town of Vence itself. St. Paul is a classic hilltop village that was rediscovered by artists in the 1960s. It’s fun to stroll the steep cobblestone streets and visit the art shops and boutiques. There is a lovely church and panoramic view at the top of the town. St. Paul musts: Le Colombe d’Or restaurant, famous for its crudités and artwork; The Fondation Maeght, a beautiful museum designed by José Luis Sert with wonderful Giacomettis, Miros, a sculpture garden and stimulating traveling exhibits; watching boule while sitting at the Café de la Place. Vence is an unpretentious town with great pizzerias (recommended: Le Clemenceau across from the Mairie) and a museum with visiting exhibits. Sit at the cafés with a Herald Tribune and Café Latté and watch the world go by. Be sure to fill up you water bottles with the water from the Foux at the fountain as you enter the old town. Just past the fountain, turn right up the Rue de Marché and shop the boutique food stores for fantastic bread, cheese, vegetables and meats. Have pizza at the Clemenceau at night and let the kids, if they are of an age to, run around the main square of the old town. Other recommended activities: Dinner at the 2 star Chateau St. Martin; hiking the trails off of the Route de Coursegoules (just past the Chateau) that will take you up to the Baous de Noir and Blanc, the cliffs behind our house; the trail to the source of the Riou River (walk up a beautiful stream to clear mountain pools between steep cliffs); the old town of Nice on market days; the Matisse chapel, Matisse and Chagall museums; the fireworks in Cannes; beaches on Cap d’Antibes. Scenic drives through gorgeous gorges and hilltowns. There is a great deal more, but that’s a start.